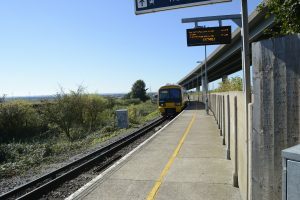 Swale station is situated at the end of the Kingsferry Bridge, on the mainland side of the Swale, the piece of water separating the Isle of Sheppey from the rest of Kent. The area is mainly industrial but is the nearest station to Iwade, just over a mile away. It is directly beneath the A249 Sheppey crossing. Shell Beach is accessible on the Sheppey side of the bridge and is a lovely place to explore. Elmley Nature reserve is also close by which is a haven for wildlife. For more information about things to do around Swale Station, why not take a look at the Visit Swale or Visit Sheppey websites.